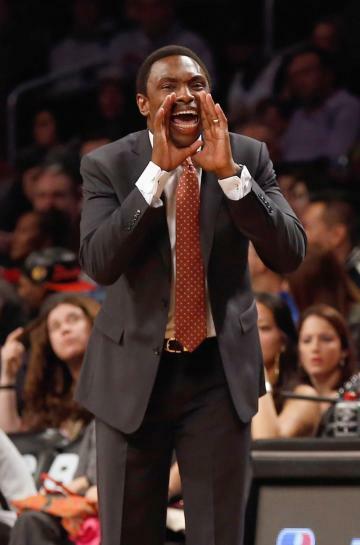 The Brooklyn Nets have fired coach Avery Johnson. Assistant coach P.J. Carlesimo was promoted to interim head coach. The Nets will let Carlesimo coach in the short-term, but GM Billy King is expected to talk with several candidates about taking over the job on a full-time basis, sources told Yahoo! Sports. If the players respond to Carlesimo and the team gathers momentum, there's a chance Carlesimo could finish the season. The Nets (14-14) squandered an 11-4 start, have lost 10 of 13 games in December and are currently 6½ games behind the New York Knicks in the Atlantic Division. One of those losses was an embarrassing outing against the Boston Celtics on Christmas, a 93-76 loss. Johnson was 60-116 since becoming the Nets' head coach in 2010. Carlesimo has been a head coach in Portland, Golden State and Oklahoma City. The Nets made a big push in the offseason to become contenders in the East, re-signing Deron Williams to a five-year, $98.8 million deal and trading for Joe Johnson, who had four years and nearly $90 million left on his contract. Williams sat out of Wednesday's loss to the Milwaukee Bucks with a sore wrist, an injury he aggravated Tuesday against the Celtics.